The DJI Mavic 2 Pro and Mavic 2 Zoom are the newest foldable drones, giving you a harder decision to make in 2018 if you didn't already buy the DJI Mavic Air. 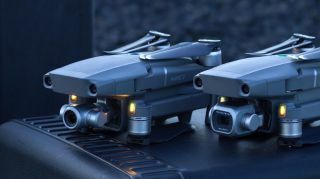 The differences between the DJI Mavic 2 Pro and the Mavic 2 Zoom come down to the 4K cameras. Do you want crisper, color-rich video or tighter, optically zoomed shots? You are going to have to make some tough choices here. What's the difference? You're going to get a superior Hasselblad camera with a larger sensor from the Mavic 2 Pro. It's closer to a DSLR on a drone, which DJI says that consumers have been asking for. This is the most pro-level, prosumer drone we've seen, so it's more expensive than the Zoom and noticeably more expensive than the original DJI Mavic Pro and this year's Mavic Air. Update: We added new hands-on photos to this DJI Mavic 2 Pro and Mavic 2 Zoom explainer page, and a link to the ongoing review. We'll continue to expand this article with our findings as we take to the sky and embed video samples. The DJI Mavic Pro Zoom the first foldable consumer drone with optical zoom and it's ideal for close-up Full HD video (normal video is in 4K, don't worry) and huge panoramic landscape shots. It's also expensive, but slightly cheaper than the DJI Mavic 2 Pro. Close-up shots without flying your drone into the Statue of Liberty are going to be possible with this gimbal-stabilized drone camera. Both new DJI drones are poised to be a part of our best drone list when they launch. Want more? We've detailed the Mavic 2 Pro and Mavic 2 Zoom tech specs below. You have some decisions to make, and you need to make them right away. Both the DJI Mavic 2 Pro and Mavic 2 Zoom are available to pre-order today, at the time of writing, and both drones will ship today, according to the company. The Mavic 2 Pro is more expensive at $1,500 (about £1,299, AU$2,000), which is more expensive than the original Mavic Pro price at £899, $999 and AU$1,349. The Mavic 2 Zoom price is at least closer to the original Mavic Pro price. It costs 'just' $1,249 (£1,099, about AU$1,700). Both drones have 'Fly More' bundles available at an additional price, outfitting you with extra propellers and batteries. It'll cost $319 (£279, about AU$438) for everything in the base package and two additional batteries, a multi-battery charging hub, a car charger, a battery to power bank adapter, two pairs of propellers and a carrying bag. DJI's Fly More accessories can be bought separately from the drone for the first time (you used to have to decide to get the drone with this bundle or without it). To make everything easier to buy, DJI is introducing 'DJI Trade-up' in select countries, which lets you trade in an older DJI drone in an effort to get you to upgrade. We'll update the worldwide pricing details, and release date and shipping information when DJI fills us in. The DJI Mavic 2 Pro is focused on superior image quality, with DJI touting its partnership with its Hasselblad partnership and a 1-inch CMOS sensor. Its camera is able to the camera captures four times as many levels of colour per channel compared to Mavic Pro. There's 8GB of internal storage onboard, just in case you forget for microSD card. You're also going to get 20MP still photos with enhanced color accuracy and Hasselblad’s Natural Color Solution (HNCS) technology. The DJI Mavic Pro 2 has an adjustable aperture from f/2.8-f/11 provides more control across a wide variety of lighting conditions. The DJI Mavic 2 Zoom is ready for your close-up. It features a 2x optical zoom lens that can install jump from 24mm to 48mm in 4K. Combined with the 2x digital zoom, you can simulate a 96mm telephoto lens with full HD video ... on a drone. The Zoom uses hybrid auto-focus on that combines phase and contrast detection for higher focus accuracy with an increased focus speed of up to 40% faster than before. It can capture 12-megapixel photos, and there’s a new or Super Resolution feature that uses optical zoom to automatically capture and stitch nine photos together for a highly detailed 48-megapixel image. This makes the Zoom the drone you want for landscape photography. Here’s another exclusive perk to the DJI Mavic 2 Zoom: its new Dolly Zoom QuickShot mode can automatically zoom on subjects as it flies away, keeping you (or whatever you are shooting) the same size while the full background of the scene is revealed. We’ll test this feature soon when we bring the drone out to the field. Both drones are the most technically advanced foldable consumer drones that DJI has made, and the advancements mostly come down to the cameras. They shoot 4K UHD video with a maximum bitrate of 100 megabits per second and they use the H.265 compression codec to reduce file sizes (they can still get big when you go to edit them on a laptop). The most interesting new mode is Dolly Zoom, a cinematic tool that used to require large Hollywood cranes. You can have the drone move backward, while the camera zooms forward, creating a dramatic pull-away-close-up effect. DJI showed off a new Hyperlapse mode that really take advantage of the Zoom, with an unedited timelapse of the New York skyline from a safe, legal distance. "This visual effect one reserved for professionals is now available for everyone," said DJI Senior Communications Manager Michael Oldenburg. He then showed off how the active tracking capabilities can now see in a third dimension, in case the subject, in this case a car on a track that briefly goes under a mountain. Photographers will appreciate the enhanced HDR that's supposed to produce ghost-free photos with a high dynamic range – the the Mavic 2 Pro with 14 stops of dynamic range and the Mavic 2 Zoom up to 13 stops.